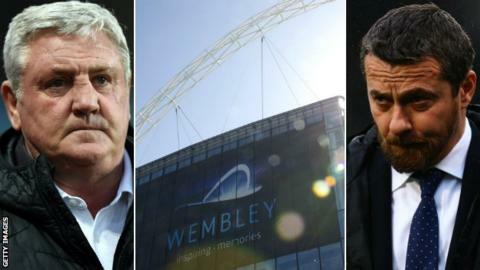 Wembley hosts the English Football League play-off finals this weekend, with the winner of the Championship play-off final on Saturday set to receive at least £160m in revenue. That figure, which has been calculated by Deloitte and is spread over three years, could rise to £280m if either Aston Villa or Fulham manage to survive one season after reaching the top flight. "Whilst in football terms the Champions League final (between Liverpool and Real Madrid) is the bigger game, the financial rewards on offer in Kiev are dwarfed by those at stake in north London," said Dan Jones, head of the Sports Business Group at Deloitte. "The difference between winning and losing for Liverpool is a mere £4m in distributions from Uefa and they are already assured of appearing in next year's competition." The Championship final has long been billed as the richest game in world football, but the Premier League's new domestic broadcast rights deal which starts in 2019-20 - worth at least £4.5bn - means a longer-term windfall if Saturday's victors can avoid an immediate return to the second tier next season. The 2017-18 campaign was the first in seven years in which all three of the promoted clubs - Newcastle, Brighton and Huddersfield - avoided the drop back into the second tier. While Villa and Fulham stand on the brink of a financial windfall, as well as the on-pitch challenge of promotion to the Premier League, there is plenty at stake in the weekend's other play-off matches at the national stadium. Rotherham United face Shrewsbury Town in Sunday's League One final, while the EFL season is completed when Coventry City take on Exeter City in the League Two final on Monday. Live text commentary of all three EFL play-off finals will be available on the BBC Sport website and app. This year's Championship play-off final features two clubs who were, until recently, established Premier League outfits. Aston Villa were founder members of the rebranded top flight in 1992-93 but were relegated in the summer of 2016, while Fulham spent 13 years in the top flight before dropping back into the second tier in 2014. Villa started the campaign slowly, with just one win in their first seven games, but manager Steve Bruce managed to lift them into the play-off places. "You just know there's a big game in the air, and there's none bigger than this," Bruce, who is chasing his fifth promotion to the top flight as a manager, told BBC WM. "I've thoroughly enjoyed the challenge of my 19 months here. Can we now top it off by getting where we want to be?" Fulham's promotion bid was built on a 23-match unbeaten run which was ended on the last day of the campaign at Birmingham, as the Whites missed out on automatic promotion by two points. "We have an important chance in front of us," boss Slavisa Jokanovic said. "We expect to follow our style and be confident. This is a really great kind of pressure and we feel the responsibility in front of our supporters and the board of the club." Shrewsbury's automatic promotion bid, built on the back of a 15-match unbeaten run at the start of the campaign, ultimately fell short as Wigan wrapped up the title and Blackburn clinched second place. Town have not played in the second tier since 1988-89, and spent the 2003-04 season playing in non-league. "We wanted automatic promotion and we just fell short," boss Paul Hurst told BBC Shropshire. "A lot of people would love to be in the position we're in now. The players have already had an incredible season and we just hope there's one very special day left." Paul Warne has steadied Rotherham following their relegation from the Championship last season, which saw their three-year stay in the division come to an end. "Everyone in the squad has had a big impact in getting us here," Warne told BBC Radio Sheffield. "The lads have bought in to what we are trying to do. They're attentive and train hard. Everything feels really good at the moment." Coventry are looking to seal an immediate return to League One, having finished sixth in their first campaign in the fourth tier since 1958-59. Remarkably, this season is the first time the Sky Blues have sealed a top-six finish since 1970. "We are one step away but you don't want to tempt fate," boss Mark Robins told BBC Coventry & Warwickshire. "The connection between the supporters and the players is as good as I have seen anywhere and that makes for a great combination. The shift around from when I came in the door is immeasurable." Exeter City return to Wembley a year on from losing to Blackpool in the League Two play-off final. Boss Paul Tisdale, now the longest-serving manager in the top four tiers following Arsene Wenger's departure from Arsenal, says the Grecians can only benefit from their experience 12 months ago. "[We have] experience of the build-up, the logistics, the preparations and what it felt like to lose," Tisdale told BBC Radio Devon. "Don't forget we've been there before in the Conference days, winning one and losing one, so we've got the full spectrum of emotions. "It will boil down to a point where you can say to the players 'just play your best'."